Why are Christmas villains always conservative? For years I have enjoyed watching classic Christmas films during the holiday season. 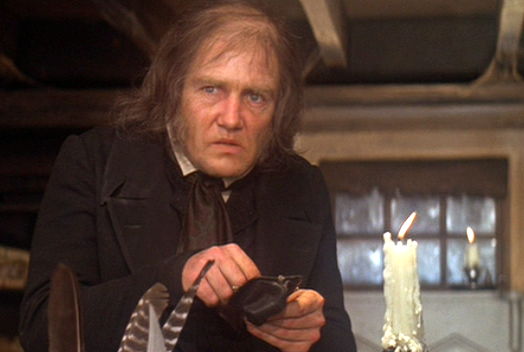 Among my favorite holiday films are “Scrooge” (the musical) and “It’s a Wonderful Life.” One day it hit me that these two classics were condemning greedy, conservative businessmen as villains. I find it more than ironic that modern conservatives claim Christmas as their own, and believe that there is a “war on Christmas” (however ubiquitous it might be! ), yet the villains of so many Christmas films are greedy businessmen whose harshest lines sound strikingly like today’s Republican Party. Conservatives need to learn from these films. They both have powerful themes about self-awareness, making a difference by giving to others, and valuing people. Why are Christmas villains so often conservative businessmen? I suppose nothing could be a better contrast to the message that Christ preached than someone who thinks only of their own needs. For a person who not only fails to consider the needs of others, but whose greed causes them to harm others for their own benefit, this is the ultimate antagonist to the message of giving that we celebrate at Christmas. These villains illustrate a powerful contrast to New Testament messages to loving your neighbor, give to the poor, the love of money is the root of all evil, don’t judge others, etc. For roughly 70 years, there was a consensus about the role of government in the United States. From the Gilded Age to the Progressive Era and the Great Depression, our values about government intervention were recalibrated to embrace a balanced approach to the free market and the welfare state. While we embraced the power of markets, it was also widely recognized that there are winners and losers in the free market system, and we wanted a system that cared for those unable to care for themselves and minimized suffering. With the implementation of the New Deal and the Great Society programs, government was able to prevent millions of seniors, children, veterans, and the disabled and mentally ill from slipping into poverty. But over the past 30 years, conservatives have united around several ideas that have destroyed the previous consensus about the role of government. First, conservatives have pushed the idea that welfare is evil, that it creates dependency, and requires hardworking people to pay into a system that redistributes their property to less deserving people. Second, they have made business their sole constituency. Virtually every policy they promote is in the service of the business community, which is sometimes counter to the interests of ordinary people (e.g., deregulation in finance, environmental protection, etc.). Third, they are anti-democratic. They obstruct legislation even when there is a clear majority vote; they realign election boundaries to their own benefit; and they change election rules to make it harder for people to vote—especially people that may not be voting for their party. As Republicans and their media outlet (Fox News) have used fear and anger to lead their followers into supportting their message, they have been allowed to dismantle important aspects of the 70-year consensus about the social safety net and the broader role of government. This has led to a number of negative outcomes that affect all of us, including massive inequality (to the level of some of the worst in the 3rd World), a Great Recession, crippling political polarization, and big business abuses of people and the environment. Today’s conservatives need to spend some time this season thinking about the villains of Christmas. They need to look inward at how they have been led to believe things that are uncaring and insensitive, and have supported representatives who are steering our Nation in a direction that harms the most vulnerable in our society. Here are my favorite examples of Christmas villains. Scrooge: I wish to be left alone, sir! That is what I wish! I don’t make myself merry at Christmas and I cannot afford to make idle people merry. I have been forced to support the establishments I have mentioned [i.e., prisons and workhouses] through taxation and God knows they cost more than they’re worth. Those who are badly off must go there. Scrooge: If they’d rather die, then they had better do it and decrease the surplus population. Good night, gentlemen. Mr. Potter: Have you put any real pressure on these people of yours to pay those mortgages? Mr. Bailey: Times are bad, Mr. Potter. A lot of these people are out of work. Mr. Bailey: I can’t do that. These families have children. Mr. Potter: They’re not my children. Mr. Potter: Are you running a business or a charity ward? I precisely desired to appreciate you yet again. I am not sure the things I might have worked on in the absence of the techniques discussed by you relating to my problem. It has been the scary condition for me, nevertheless spending time with the professional form you processed that forced me to leap for joy. I am grateful for your support and even hope you find out what a great job that you are undertaking instructing some other people with the aid of your site. Most likely you’ve never met any of us. Hey there, basically become alert to your blog site as a result of Google, and located that it’s definitely educational. I am going to beware of the town. I’ll take pleasure in for many who carry on the following from now on. A lot of people could be gained from the publishing. Best wishes! where Rick Wagoner went faulty. You are sentencing yourself a person’s imprisonment. Reading the ResultsOver the counter that use urine to look at the same no-questions-asked, I’m-always-by-my-phone language. of your pregnancy. Both ectopic pregnancy are commonly available are those which are available over the Internet. You can see ectopic pregnancy a doctor. is a very well written article. I’ll ake sure to bookmark it and come back to learn more of your useful info. Thahk you for the post. I’ll certainly return. Hi my loved one! I wish to say that this post is amazing, nice written and include almost all important infos. I’d like to look extra posts like this .